Our new quarter-turn latch combines the ruggedness of zinc die with robust engineering grade polyamide in an IP69K quick clip-fit assembly which enables time and cost savings in the production phase of enclosures, housings and access panels, while ensuring an exceptionally high degree of sealing for harsh environments. 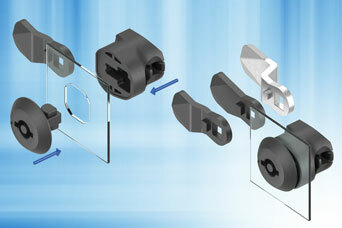 Insert/escutcheon assemblies are available in zinc die/polyamide, polyamide/zinc and zinc/zinc with rear assembly and cam in polyamide – they are suitable for panel thicknesses of 1.0mm to 1.5mm using a standard EMKA cut-out. Share the post "Quick assembly IP69K quarter-turn latch"